Commercial Grade Split Wine Cellar Cooling Systems from the local Los Angeles based US Cellar Systems suppler. These include a vast range of products for wine cabinets, closets, larger wine storage rooms and difficult spaces. Although these are built as commercial systems they are priced extremely competitively. This means they can be an ideal solution for a residential application where quality and reliability are a critical factor. Call for price and or for help with selecting the right system for your application +1 (323) 578-3330. These units provide greater BTU cooling per cubic inch of required installation space making CC the best choice for a cooler needing a very low set point as with white wines. Depending upon configuration – Call for a price for your application +1 (323) 578-3330. 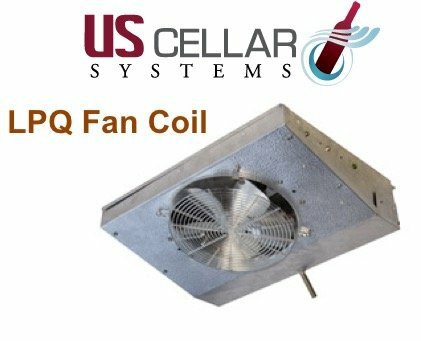 The LPQ series is one of our most popular wine cellar cooling units for a reason. It offers a lot of options for a lot of Los Angeles wine lovers. Comes in either twin or triple configuration, making it ideal for larger wine cellar applications. Staggered, mechanically expanded copper tubing in aluminum fins for high performance. Humidity balance is achieved through automatic expansion valve which ensures constant coil temperature. These are one of our most popular wine cellar cooling systems because of their versatility. They are designed to deliver refrigerated air sufficient for medium-high temperature locations, a perfect choice for the Los Angeles area. These systems’ evaporators mount horizontally, often within the wine racking. These can also be placed between ceiling joists, on a wall, or in a soffit. We often use them when installing custom wine cellars, wine tasting rooms, or in large custom wine cabinets. For those worried about the noise produced by wine cellar, we often recommend the LPQ series by US Cellar Systems. Twin evaporator systems can be used for very large wine cellar applications. Pump-down solenoid valve protects the compressor in the unlikely event of a leak, reducing the risk of damage. As the name suggests, this is a great system for clients concerned about the noise that their wine cellar might make, offering a very quiet and dependable option. They also require very low maintenance and are great for long-term storage. These cooling units are mounted in the ceiling and are an excellent choice for vaulted rooms. Because of the LPQ series design, it promotes circulation within the wine cellar system, which makes it one of our top choices for installation for clients. The DQ Series for large cabinets or wine cellars. Ideal for large cabinets and walk- wine cellars. To promote amazing circulation in long or narrow display cases, the Dual-Air Quiet (DQ) Wine Cellar Cooling Systems are a good choice. 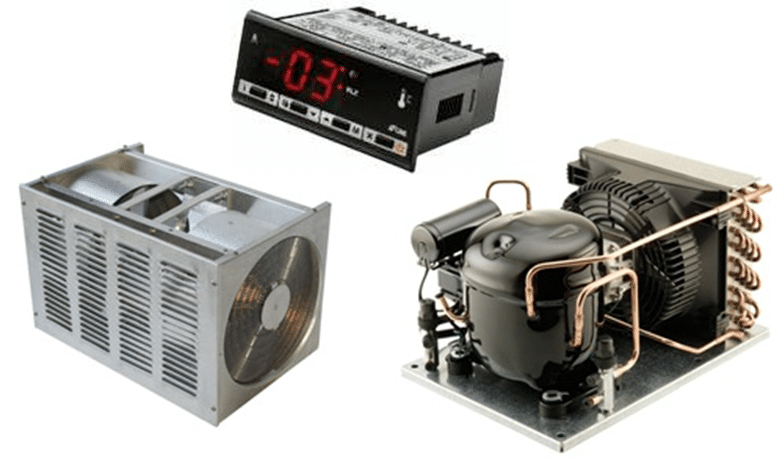 They provide refrigerated air from to 55-65 °F. 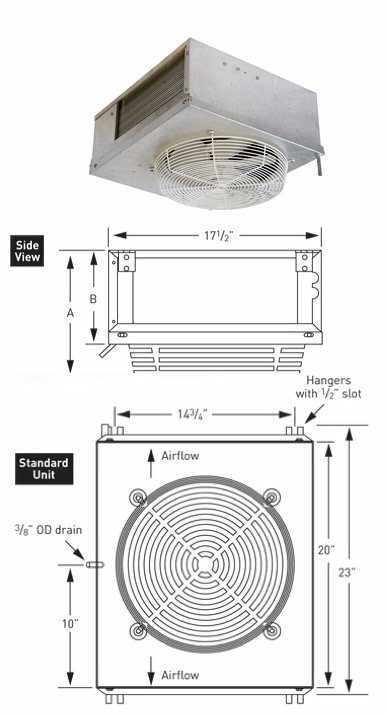 DQ evaporators return air at the bottom and supply two-way air discharge 10-12 feet in both directions at a medium velocity airflow. 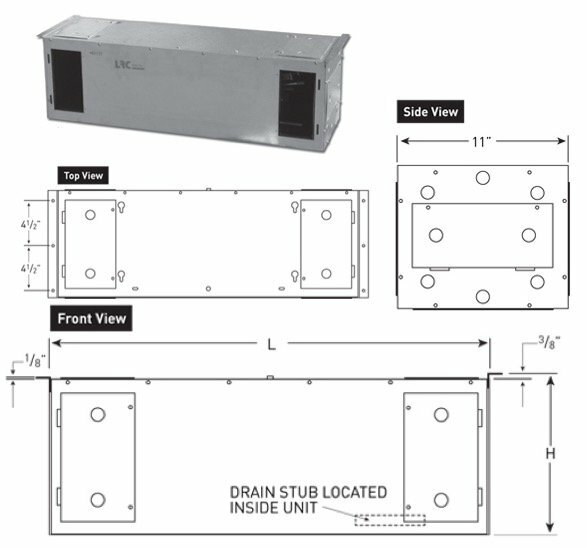 DQ series evaporators offer cooling capacities from 1,800 to 4,600 BTU per hour. The are used with an R134a refrigerant. Designed for medium-high temperature wine cellar spaces. If the refrigerated room is as far as 25 feet away, you can choose to install this power HS evaporator. This can eliminate noise or the inconvenience of an in-room evaporator, which frees up valuable space. 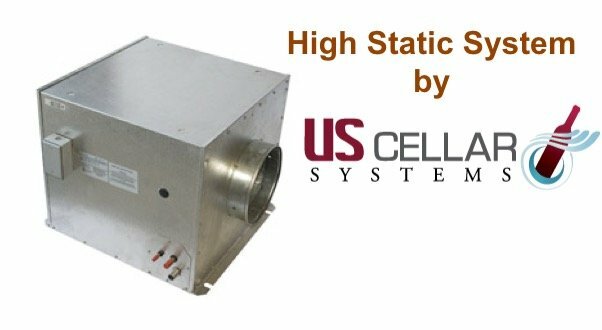 HS evaporators are available in capacities from 1,800 to 20,000 BTU’s per hour and are used with an R134a refrigerant. Has the flexibility of being placed between ceiling joists, in a soffit, or directly onto a wall. This commercial grade, high performance cooling system is a popular option. This vertical rack mount system is engineered to provide cool air to medium-high temperature in wine cellar spaces. 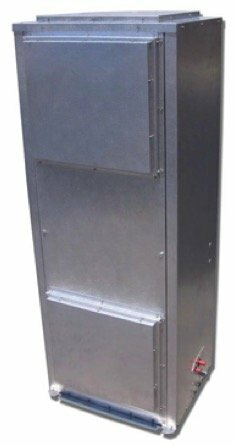 VRM evaporators mount vertically and have multiple panels to access direct or re-direct the supply and return vents. This series is one of US Cellar System’s most popular and versatile options. They are manufactured in standard capacities ranging from 2,600 to 6,600 BTU per hour and are used with R134a refrigerant. For medium to high temperature spaces. Are you looking for a virtually silent refrigeration system for your wine cellar? Do you want to duct your air from outside of the cellar, leaving as much room as possible inside the storage area for wine stock? Do you need a powerful evaporator that can be placed as far as 25 feet away from the wine room? This may be the right cooling unit for you. 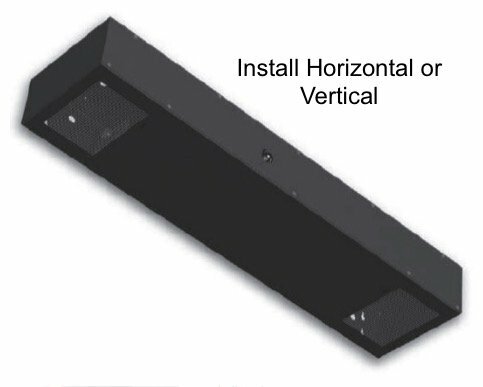 Designed to mount vertically between standard wall studs. If you’ve got an odd shaped room, this may be just the right choice as your wine cooling system. It’s similar to a through-the-wall unit as the thermostat and temperature sensor installed. But the big advantage to this unit is that it requires no exhaust, and only impedes an inch into the room. Designed for medium to large humidity controlled spaces like wine cabinets/walls, fir cabinets, and tobacco humidors. Designed to maximize the space within your wine cellar storage space. 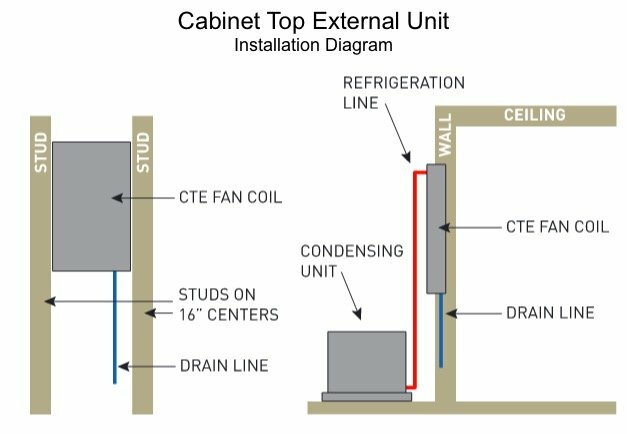 It is installed outside the cabinet, either vertically or horizontally. For cabinets that require 2,513 to 3,547 BTU per hour. You can special order chilled models. Designed small to accommodate medium to large sized humidity controlled wine cabinets/walls, fir cabinets, and tobacco humidors. Flat black powder coating with other colors available. Thermally protected with a PSC motorized impeller. 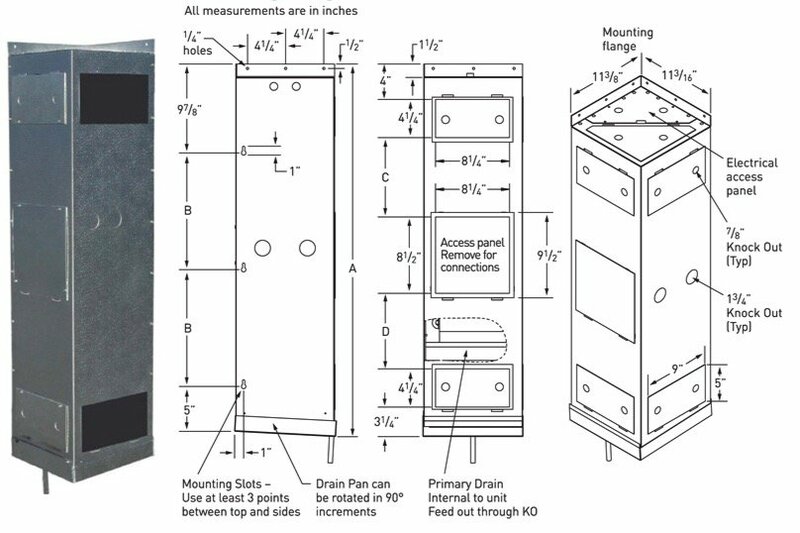 For minimum space usage, this unit’s evaporator has only a 6” profile. Available in capacities from 1,537 to 3,546 BTU/hour. Can be used with R22, R134a, or R404a refrigerants. Special order chilled water models.